Children often rely on routine or repetition in their early days of formation. Learning through repetition is one of most basic fundamentals of learning and having a daily schedule of predictable sequence helps a child feel secure. As most parents do not have a flexible schedule to attend to the needs of their growing child, some parents enroll their kids at a daycare center. Daycare centers commonly have daycare schedules where the child learns the basics of play that should provide a good start in the learning process of the child. 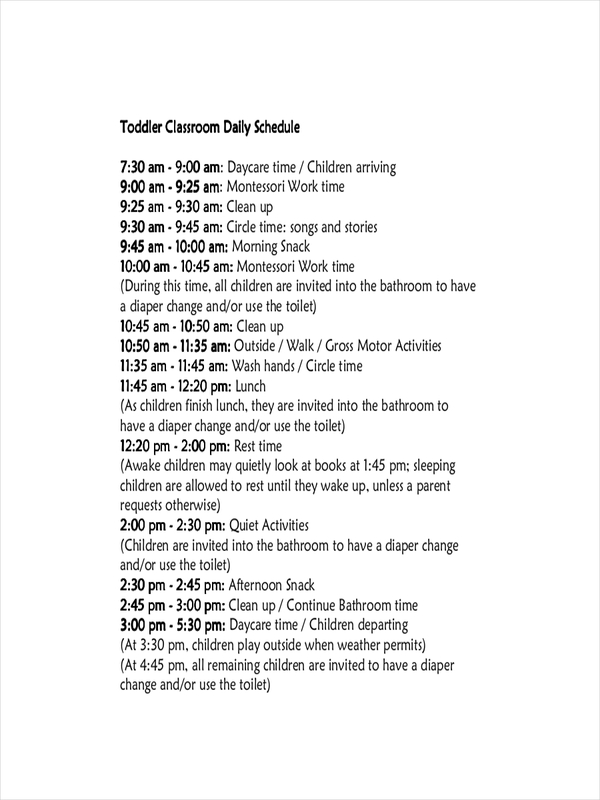 Scroll down below for schedule examples of daycare. 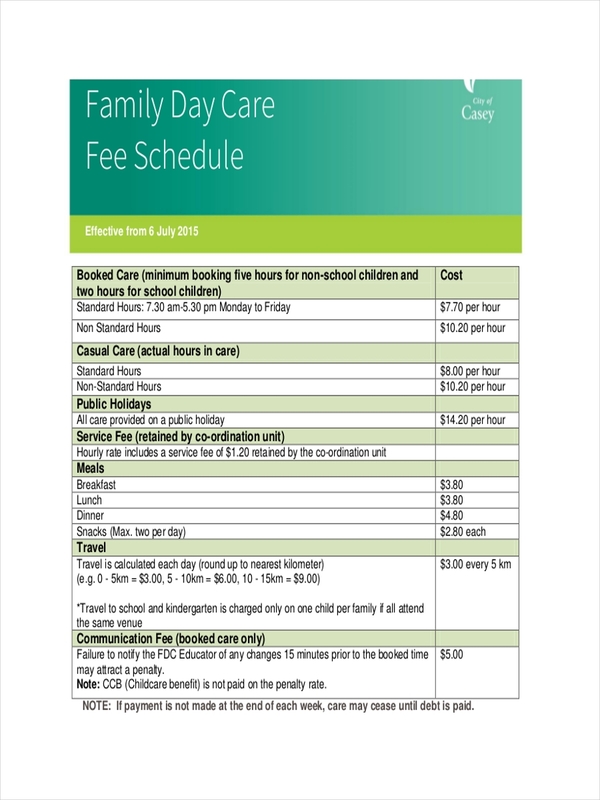 What Is a Daycare Schedule? 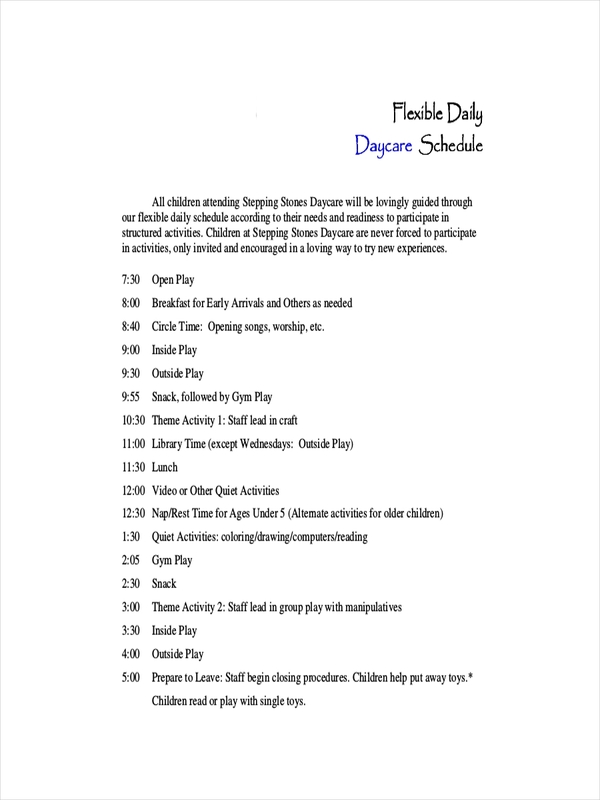 A daycare schedule is a carefully designed schedule used as a tool to promote a child’s learning and development with balance of free play and teacher planned learning activities. 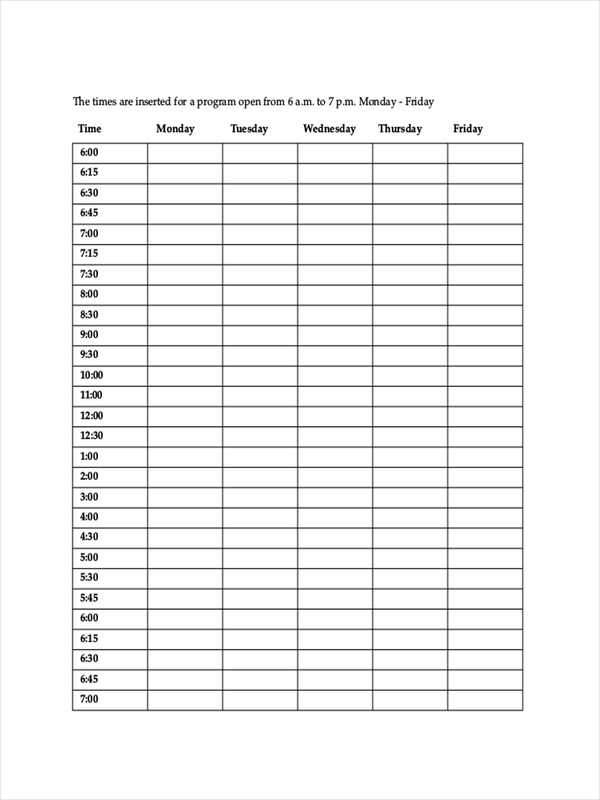 Schedule examples in Word and employee schedule examples further explain how a daycare schedule is structured and formed. Feel free to click on the download link button below the sample to access the sample for perusal. 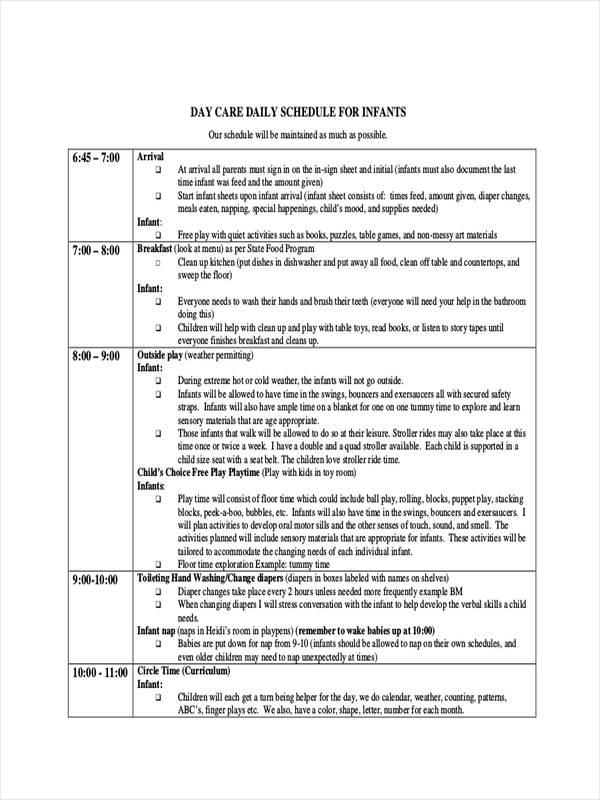 A daycare schedule is designed to be as repetitive as possible so almost all activity for the day are repeated to give the child a sense of security knowing what to expect next. 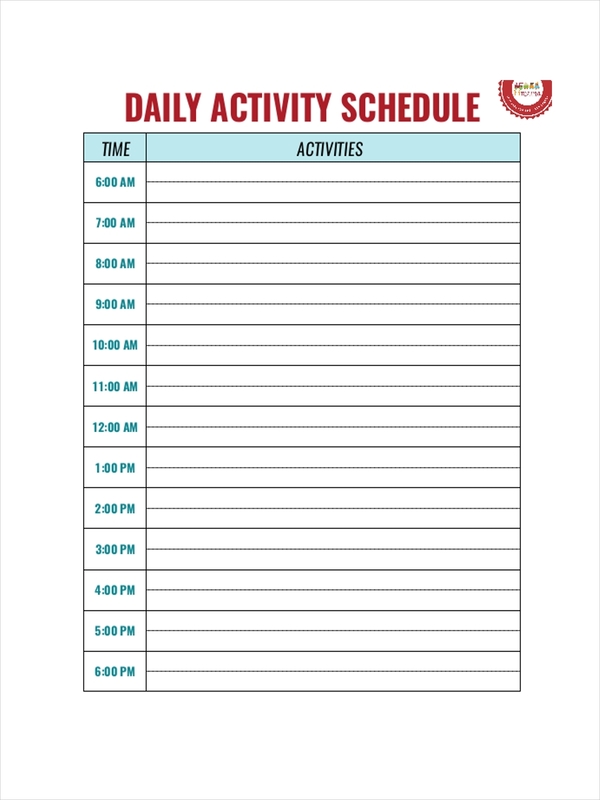 Daycare schedules also incorporate transition times in order for a child to know what to expect next and do associated tasks in preparation for the next activity sheet. Some activities also teach flexibility by changing factors involved in an activity to help a child become more resilient to change upon getting older. 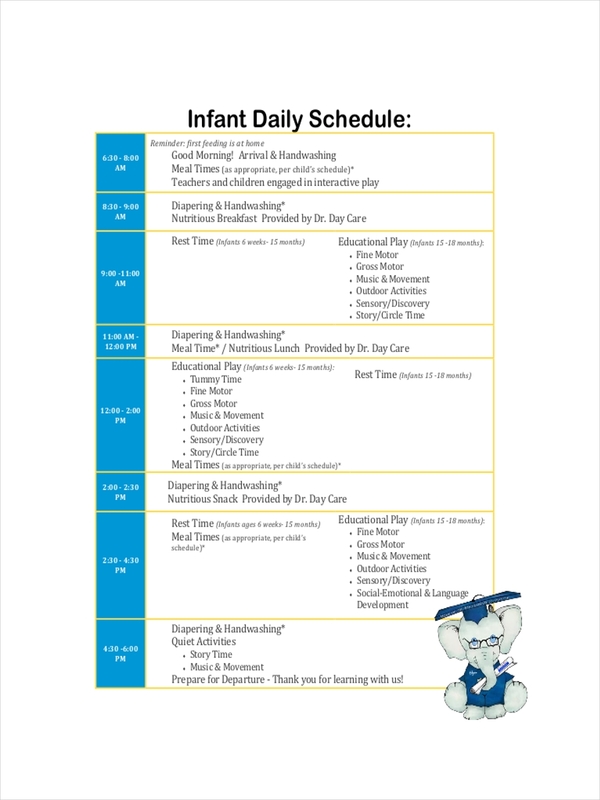 Sample schedules and shift schedule examples seen on the page can help you understand a daycare schedule better and how it is made. Be sure to click on the individual examples to get a closer look at the sample. Free play – This is the core of a carefully planned learning schedule. It involves different toys, activities, and material that encourage a child to explore and learn. Cleaning up – Made to develop a child’s motor skills and sorting skills. This activity helps develop pride in accomplishing a task or activity. Group time – Made to develop listening skills, patience, and taking turns. Breakfast/lunch – Children learn about nutrition while practicing social skills and table manners. This also helps develop positive attitude toward food. Learning activities – Activities in art, music, math, science, and literature develop muscle movement further. Outdoor play – This activity develops the physical attributes of a child and helps the child prepare his body for future growth and development. Story time – Stories develop a child’s natural ability to read and imagine. Naps – Naps give the growing bodies of children time to absorb information that was just being given. Studies show that naps help enhance memory and supplement learning. 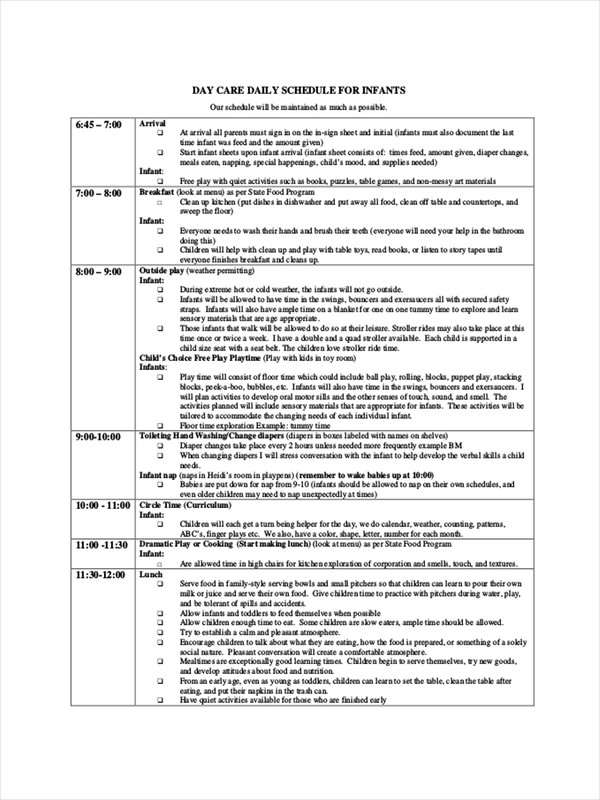 Schedule examples in PDF are found here for your review. They are made easily available for download by clicking on the download link button of the chosen file sample.